Again, I am no expert. But since the experts keep quiet or lie, I do talk, knowing the risk my analysis overlooks technical details obvious to an expert in the field or professional cabin crew member. If so, please comment! Let’s analyze the posibilities… and explore what might have happened. 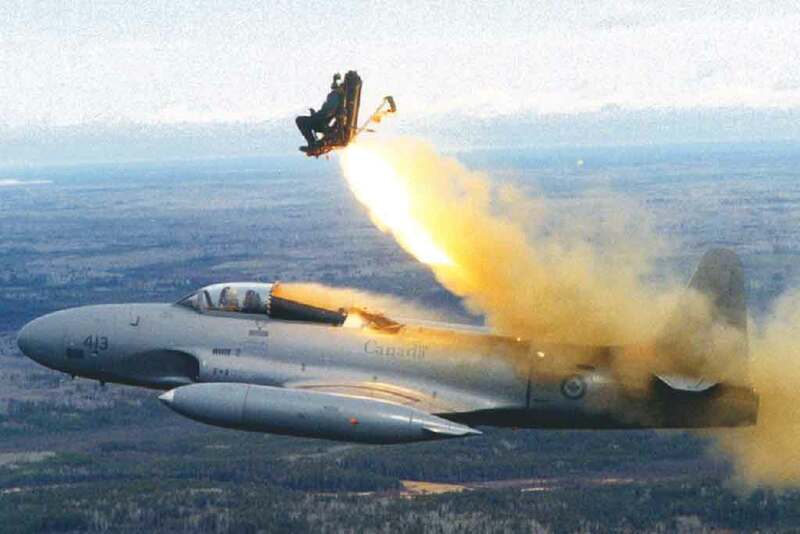 What does an ejection seat need? The amount of space similar to a pilot seat. It needs a system to catapult the seat out of the plane and a rocketering mechanism. The fuselage of the plane should automatically open, without the plane disintegrating. The seat should be of enhanced material to provide soft support and real strenght. The pilot is not dressed for the occasion, so the seat needs some protection layer and some sort of helmet. An alternative would be a seat in a small ejection cabin. It requires a parachute, which is at least the size of a small backpack. And the pilot should be able to access it, without being stopped. There are 2 options. An existing seat is secretly enhanced into an ejection seat. Or an ejection seat (or cabin) is added to the plane, unnoticed. This particular airplane was inspected in Düsseldorf just the day before. In Barcelona they would have had some time to do work on the plane, but we do not know this for certain at the moment. Now let us look at potential locations, escape routes out of the plane, catapult directions and the impact of it on the 9252’s “a sudden shake” and “the right wing hit something”. 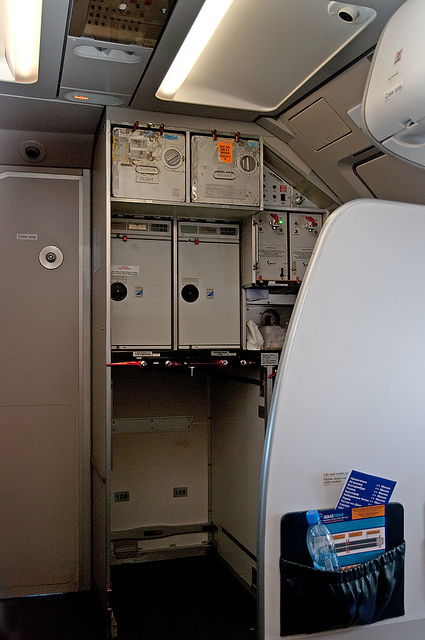 The location of the ejection cabin/seat should be (left or right) next to the door to the cockpit, as that is the location where the pilot is. Since this is a small narrow area, he can make sure no-one else will get close to the ejection seat and to himself, while he is (with good reason) in front of the cockpit door. The below video shows how the new cockpit door works, yet in the beginning you can see the area to the left and right of the door. The cabin crew seats to the left, next to the exit door seem a logical choice. I do not believe this is possible for three reasons: 1. How can the captain be sure these seats will be empty around the time? 2. Can the seats be adjusted with all the additional features without being noticed by anyone? 3. While there is a door, the door post is enormous and made of strong material, which will block the crew member when catapulted. In my non-expert opinion, the formal exits (doors) are not suitable for catapulting an ejection seat. Did the captain go back into the cockpit to his own seat then? That doesnot make sense. It would mess up the “proof” Lubitz caused the crash. Also, the other cabin crew members likely would have tried to follow him and “help out with problems in the cockpit”. It also requires major re-engineering of the cockpit. None of that happened. The cockpit door remains closed during the last minutes of the flight 9252. On the left is another solution: the toilet seat. Between every flight the toilet is cleaned (video link). Somehow the toilet seat could have been transformed into an ejection seat for the pilot. The lavatory is accesible for the captain and it can be locked from the inside. There are sufficient areas in the lavatory for the crew to hide equipment (like an comfort cushion or a special helmet or some ready-to-assemble ejection seat). The captain did have a few minutes before the rest of the plane passengers realized something is off. It might be possible to hide an ejection seat mechanism under the toilet, when the waste tank is taken out (who needs a waste tank, when the plane is about to crash). Again, this is a complex solution for a complex problem. What bothers me most with the lavatory solution is the escape through the fuselage of the plane. How can they have build a small door unnoticed by outsiders? Somehow I think the opening used for cleaning the waste tank is to small for a solid ejection seat. On the other side is the kitchen. At 0:14s in the first video above (top of the page), we see how the kitchen has compartments for the carts and it is open. I can’t imagine an ejection seat installed in this area unnoticed. But when we assess how cargo is transported in and out of the aircraft during stops at airports, we do get an idea of what might have happened. An ejection cabin (right) is possible and likely. They could just position it in the storage area of the aircraft, below deck, in front of the doors used by the cargo transporters This also explains why “something hit the right wing” (link). This video shows a tour of the A320 Airbus, a similar plane to the Germanwings that was crashed. At 0:40s in the video we see a door opened in the storage area below the passenger seats. It is a few meters to the back, from the kitchen area and cockpit (see 1:25s in the video) in the front of the plane. It only requires a doorway under the kitchen carts to the storage area underneath. To the right a picture of an A318 (similar body to an A320). The brown area is where the kitchen area is, in the plane that went down. The storage area (cargo/suitcases) below deck must have been accessed in Barcelona. It has a large door, certainly big enough to catapult some sort of ejection seat cabin from (blue). It needs to be catapulted strong and precise, beyond the red area. Immediately, the cabin is launched with a rocketering mechanism. It likely is the storage unit door (blue) that hits the right wing (orange). This is the only theory so far, that explains it all. When the captain in his ejection cabin is catapulted outside the plane, the aircraft will get a backlash/recoil shake, which is what happened just before the crash. Immediately after, something hit the right wing. In my theory, this is the door of the storage area below deck (the storage compartment door is pushed away, when the cabin is catapulted out off the plane). Witnesses on the ground, saw some explosion (the rocketering mechanism?) while the plane continued intact. Then the plane hit the mountain and was scattered to pieces. It leaves no trace. I know this sounds like a lot of work, but terrorism usually is a lot of work. And even a flying toilet seat still sounds more believeable, than what the media is telling us now. This is what militairy pilots prepare for. All I am suggesting is, that they prepared a terrrorist act, the way they prepare a militairy attack: with militairy knowledge. Forget the socalled “depressed” co-pilot Andreas Lubitz for a second. I just can’t believe a normal captain leaving for the bathroom, who asks a co-pilot to prepare for landing at least one hour (!) before they are supposed to arrive! Why? Perhaps because Sonderheimer hoped the co-pilot would just do it, which is another way of framing Andreas Lubitz. And as a co-pilot committing suicide: Why use the automatic pilot and take 11 minutes to commit the act? By then, the captain could have returned from the bathroom! Think about it. Why take 11 minutes to crash down a plane? I can think of one good reason: To leave the plane! This is only an alternative explanation for the existing theory that Andreas Lubitz conducted this 9252 terrorist act alone. By no means do I intend to accuse anyone of anything. I just hope I can add to the discussion. I am convinced the present trial by media for Andreas Lubitz is wrong. Wrong! This entry was posted in Maatschappij and tagged 9252, Airbus, Alps, Barcelona, co-pilot, Dusseldorf, ejection cabin, ejection seat, Germanwings, kitchen, Lufthansa, pilot, plane crash, Sky Chefs. Bookmark the permalink. 1 Response to Flight 9252: An ejection seat added to the plane, yet no-one notices? Is this possible? Het is geen bewijs dat de theorie klopt, maar de theorie past bij alles wat we tot nu toe weten.